In its latest report, ‘No Stability in Syria and the Region Without Stability for its Children’, released on the UN’s Universal Children’s Day, SNHR has revealed that at least 28,226 children have been killed in Syria since the beginning of the popular uprising for democracy. The report notes that the violations to which children have been subjected over the course of eight years, which SNHR has documented in a continuous, cumulative manner, affect not only the children’s physical and mental health, educational prospects and medical care, but also manifest themselves on a vastly more profound emotional and psychological level, leaving deep-rooted scars in their memories and shaping their identities in a distorted manner. The report tackles a range of violations, most notably child conscription, a crime practiced by the parties to the conflict to varying extents. The report also sheds light on the education sector, revealing that school attendance rates in Syria are now amongst the lowest worldwide, with three million children currently out of school in the country. This alarming figure, the report explains, can be traced back to a number of reasons – most prominently forced displacement, a fate that has befallen half of Syria’s population people, as well as a lack of job opportunities and the deliberate bombardment of schools, primarily by the Syrian regime and secondly by Russian forces, with dismantling and punishing society has been always an objective of the Syrian regime. As such, the report calls on the international community to hold those responsible for crimes against humanity committed against the children of Syria to account, most especially the Syrian regime, and to prevent any possibility of the regime’s rehabilitation or immunity. The report outlines the most notable human rights violations perpetrated by the parties to the conflict in Syria against children between March 2011 and November 20, 2018, including a summary of some of the most notable incidents that took place between November 20, 2017 and November 20, 2018. In this context, the report contains 11 accounts by surviving children, their families, or eyewitnesses. All the accounts have been collected by speaking directly with the eyewitnesses, rather than citing statements collected at second hand from any open sources. The report also draws upon the continuous monitoring of incidents and developments by SNHR’s team, as well as through verification and collecting evidence and data. The SNHR team also uses evidence collected from videos posted online or sent to the team by local activists via e-mail, Skype, or social media, all of which are verified by team members. A number of the videos, according to the report, show children who were killed or wounded in bombing, some of whom died under the rubble. Other videos show children who died of starvation and illness due to siege. The report documents the killing of 22,444 children at the hands of Syrian regime forces since March 2011. Of those, 196 children suffocated to death as a result of chemical weapon attacks, while another 394 children were killed in attacks in which the Syrian regime used cluster munitions or as a result of the explosion of old cluster remnants, and 301 others died due to lack of food and medications in many of the areas that were besieged since March 2011. In addition, no fewer than 3,155 children are still under arrest or have been forcibly disappeared at the regime detention centers between March 2011 and November 20, 2018. According to the report, no fewer than 1,173 schools and 29 kindergartens have been damaged in indiscriminate or deliberate bombardments by Syrian regime forces. The report notes that Russian forces have been responsible for the death of 1,872 children since the beginning of their military intervention in Syria on September 30, 2015, including 46 children who were killed in 232 attacks using cluster munitions. Additionally, attacks by Russian forces have caused damage to no fewer than 173 schools, while tens of thousands of children displaced as a result of the Russian attacks. The report also sheds light on the violations by the Kurdish Self-Management forces in the areas under their control, such as extrajudicial killing and conscription of children, noting that 167 children have been killed at the hands of these forces since January 2014, while 588 children are still under arbitrary arrest or forcibly disappeared at their detention centers. Furthermore, the report notes that 837 children have been killed by ISIS since the group emerged in April 2013 through indiscriminate shelling operations, clashes, car bombs, executions, and the deliberate planting of landmines by ISIS members before retreating from their areas of control. The terrorist group has also perpetrated another form of violation in child conscription in what came to be known as the “Cub Camps”. The group also committed widespread acts of sexual violence against children, ranging from molestation to sexual enslavement. At least 396 children are still either arbitrarily detained or have been forcibly disappeared by ISIS, which has targeted no fewer than 21 schools since it emerged in April 2013. According to the report, the indiscriminate shelling operations by Hay’at Tahrir al sham in the course of their attacks, primarily against areas under the armed opposition’s control and the clashes in populated areas have resulted in the killing of 60 children between the establishment of al Nussra Front, currently known as Hay’at Tahrir al Sham, in January 2012 and November 20, 2018. 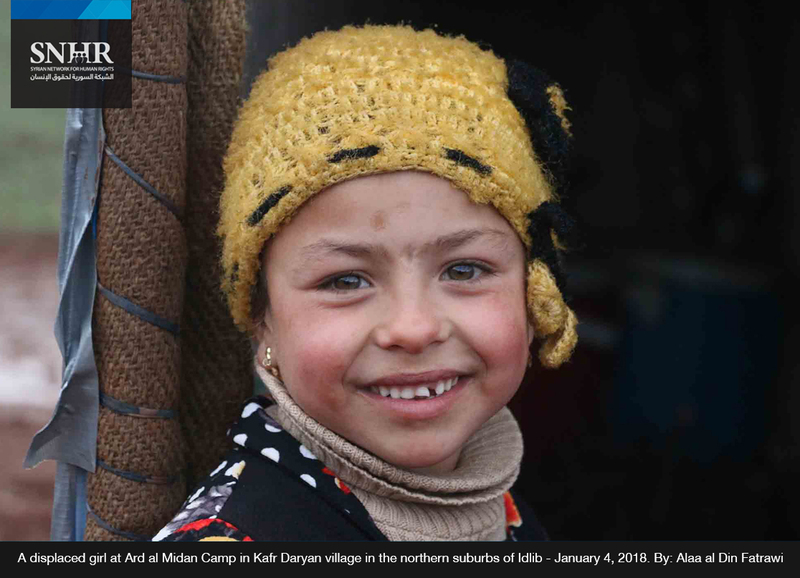 The group, which is responsible for the continuing detention or forcible disappearance of at least 21 children, has also established training camps for children similar to those of ISIS, where child conscripts are trained to using weapons. These camps have been given different names such as Ashbal al Tawhid. The group has also launched military schools which adopt special curriculums and require the child ‘students’ to wear military uniforms. The group has conscripted children through exploiting their needs and poverty in exchange for small sums of money. According to the report, attacks by international coalition forces have killed 886 children between the beginning of their intervention in Syria on September 23, 2014, and November 20, 2018. The group also targeted no fewer than 24 schools in their attacks. The report records that factions from the armed opposition have been responsible for the death of 975 children, most of whom were killed in indiscriminate shelling operations carried out by opposition forces against areas under the control of Syrian regime forces, particularly mortar shelling. At least 309 children are still either detained or forcibly disappeared at detention centers run by factions of the armed opposition. Lastly, the attacks carried out by armed opposition factions have resulted in damages to 24 schools and one kindergarten between March 2011 and November 20, 2018. The report records that no fewer than 985 children have been killed at the hands of other parties since March 2011, while no fewer than 31 schools and three kindergartens were damaged by these other parties in the same period of time. The report stresses that government forces and pro-government militias are responsible for the great majority of acts that constitute crimes against humanity against the children of Syria through widespread and systematic killing, as well as acts of torture and sexual violence in blatant violation of Article 7 of the Rome Statute of the International Criminal Court. In addition, these forces have committed other acts which constitute war crimes, including conscription, starvation, and mass siege of civilians, including women and children. All of these crimes constitute blatant violations of international humanitarian law and the relevant Security Council Resolutions. The report adds that most of the Russian forces’ bombardment has been concentrated in populated areas and centers, resulting in the death of dozens of Syrian children. All of these indiscriminate attacks qualify as war crimes. The report also notes that Self-Management forces have committed acts that qualify as war crimes through indiscriminate shelling which resulted in the death of many children, as well as conscription. According to the report, extremist Islamic groups have recruited hundreds of children aged under fifteen. In addition, these groups have perpetrated torture against children imprisoned in their detention centers, while their indiscriminate shelling operations have killed many children. All of the above acts constitute war crimes. The report stresses that different factions associated with the armed opposition have also recruited dozens of children. In addition, indiscriminate shelling by some factions has resulted in the deaths of a number of children. All of the above acts constitute war crimes. Additionally, the report notes that the attacks carried out by the international coalition have caused collateral damage involving the loss of civilian lives, including children, or injuring children, or causing excessive damages to civilian property. There are strong indicators that compel us to believe that these damages were excessive in comparison to the military advantage anticipated. The report calls on the international community to secure protection and assistance for forcibly displaced children, both IDPs and refugees, especially females, by taking into account their special needs with respect to protection in particular; to uphold the commitments stated in the Convention on the Rights of the Child; to make serious efforts to isolate the Syrian regime, and to expose and put an end to its criminal practices as soon as possible, and to support all possible sources of accountability in Syria, most prominently the International, Impartial, and Independent Mechanism which was founded by the UN General Assembly, the Commission of Inquiry founded by the Human Rights Council, and the active national human rights groups. The report also urges the international community to expose those states that are attempting to rehabilitate or sponsor the perpetrators of crimes against humanity carried out against the children of Syria. The report also stresses that all possible legal, political, and financial measures should be taken against the Syrian regime, its allies, and all perpetrators of violations in the Syrian conflict to apply pressure on those parties in order to compel them to respect the rights of children, uphold their commitment to ensuring that all financial donations that have been pledged are delivered, and to ensuring that essential relief supplies are delivered to besieged children. The Syrian regime, in particular, must be compelled to lift its sieges rather than only dropping airborne relief supplies. Additionally, assistance must be provided for the neighboring countries and every possible form of support should be supplied to improve the level of education and healthcare in these countries which house the largest proportion of children refugees. The report calls for finding mechanisms to put an end to bombing schools and kindergartens, which would also ensure that these facilities are protected, and to work to create a safe educational environment. This is considered the minimum level of protecting civilians. The report regards the issue of the children of Syria as a universal one. All the world’s states must work to alleviate the suffering of Syria’s children by supporting schools and educational and medical processes both in Syria and for child refugees. Moreover, the report stresses that humanitarian relief efforts should be coordinated on the basis of prioritizing the areas worst affected and should disregard the pressure and attempts at blackmail by the Syrian regime which wishes to exploit relief aid in its favor, adding that sufficient resources should be dedicated to rehabilitation for children while taking into account the special needs of the females who were directly affected by the violations, and those who have suffered sexual exploitation, again on the basis of prioritizing the areas worst affected. The report further stresses that it must be ensured that people coming from Syria can seek asylum and have their rights respected, including banning forced return. The states of the European Union and other countries should help to ease the burden on the neighboring counties by taking in more Syrian refugees. Meanwhile, donor states should increase their assistance to the OHCHR and the local society groups in refuge countries. Furthermore, the report calls on the OHCHR to create a stable and safe environment for Syria’s child refugees and to make more efforts to socially reintegrate them through the provision of long-term psychological therapy, and through enhancing investment in education and healthcare. Lastly, the report stresses that the Syrian regime should uphold its pledges in accordance with its ratification of the Convention on the Rights of the Child, as well as two international covenants, and the Geneva Conventions, while asserting that all the parties to the conflict should cease deliberately bombing schools, kindergartens, and residential areas populated by children and their families, and stop killing, injuring and disfiguring children. In addition, all parties to the conflict should immediately release detained children, particularly those who were detained on the grounds of armed conflict, and adhere to international laws against detaining children, especially females.